I had a wonderful Easter weekend planned. The weather forecast looked great. Perfect weather for breakdown printing. And so I soda soaked a big pile of fabric and made up some screens to get me started. Brilliant. But things don’t always go to plan. On Wednesday afternoon I had a massive hayfever attack that just kept on going into the weekend. I have had hayfever since I was a child although it has become less severe as I’ve got older. And (you will not be surprised) I plan for it. I start taking antihistamines each day from 1st March and these are normally enough to keep it at the ‘snuffly’ nose level through the spring and early summer. This year I got caught out with my first attack in late February so will start taking antihistamines from the beginning of February next year. But even taking extra antihistamines this weekend didn’t help. Which has been very annoying! Some people might just take time out but I have an exhibition to get ready for. I knew that it would be hopeless trying to print but I always have a Plan B. That is the joy of working in series and of working on multiple pieces at once. So, in between spells lying down in dark room calming my nose and my breathing down, I have been doing what I call ‘quiet’ work on one quilt. Sat down, drawing out shapes then fusing on hundreds and hundreds of circles. 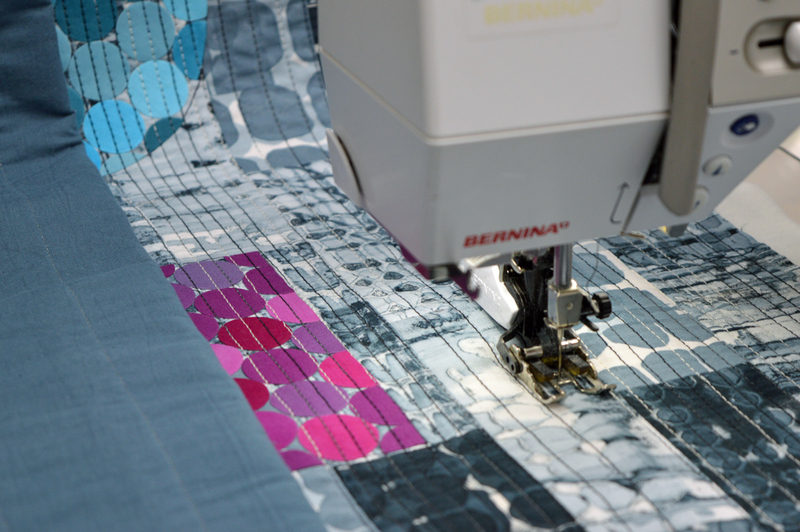 And have been stitching down facings on another quilt. I track my time in the studio and can see that I lost 13 hours compared with the previous week but at least I have achieved some things by switching from Plan A to Plan B! Hooray for Plan B! In my old life I used to do spend some of my time training people how to use particular pieces of equipment or how to carry out specific tests. I knew the equipment and tests inside out. There was always a correct and incorrect method. A needed to be followed by B which needed to be followed by C etc. With experience I learnt to pass on the information more effectively but it was always the same information. Teaching surface design is very, very different. 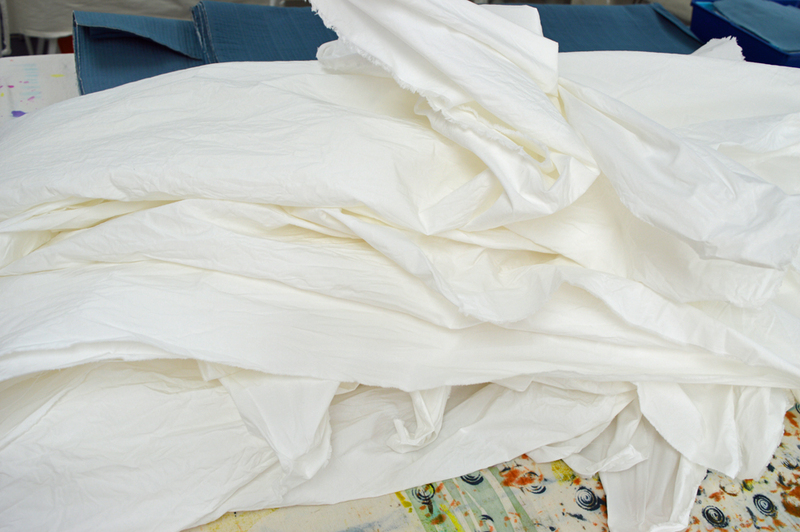 Yes, there are a few rules that have to be followed if you want the colour from your Procion dyes to fix to your fabric. (Always remember soda + moisture + heat + time). And I do supply my students with sets of recipes that they can choose to follow rigidly (or not!). But pretty much everything else is about personal choice. There are no rights or wrongs, just choices. So my role as a teacher is that of an ‘enabler’ providing encouragement and support. And I am still learning how to be a good teacher. The more classes I teach; the more students that I spend time with, the more I am learning to tailor my support to fit different needs. My students tell me that I am very well organised - writing class notes, preparing lots of samples, labelling all the cupboards is stuff that comes easily to me. 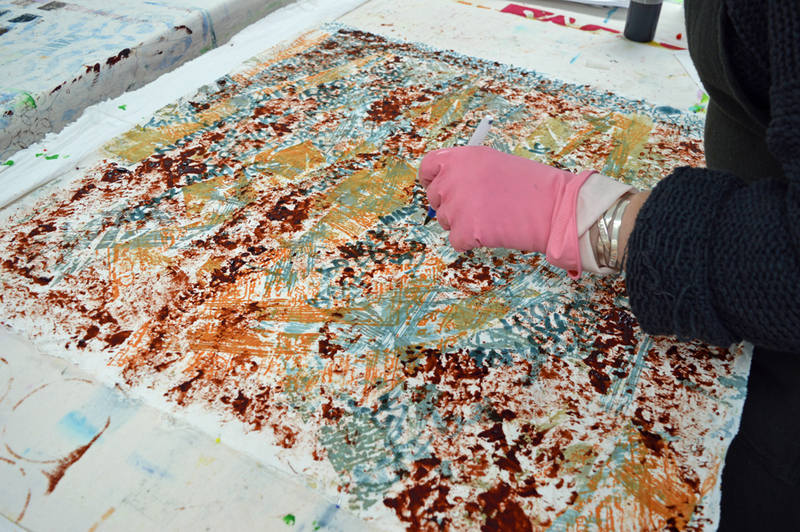 Learning how to nurture the creative process in others is harder but so very satisfying! The other difference is depth of knowledge. Or in some cases, lack of depth. 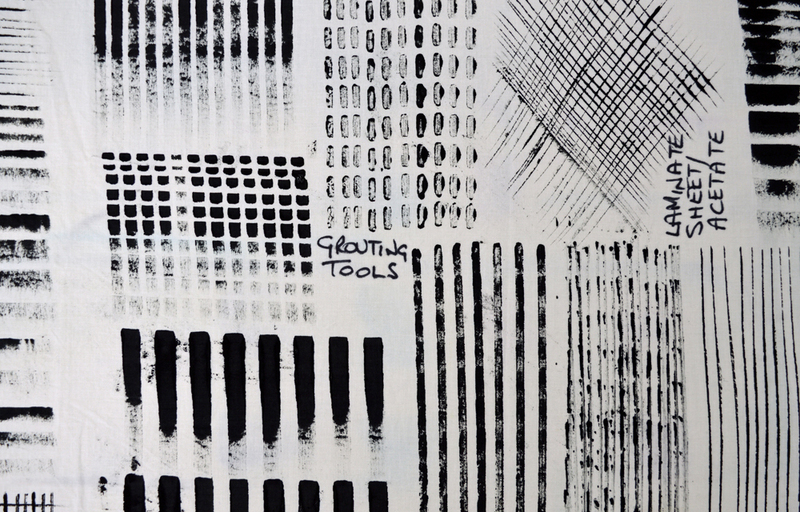 I have spent hundreds of hours over the years screen printing (especially breakdown printing) and dyeing and, although there is always more to learn, I can teach with confidence. But there are some areas of surface design where I have not spent hundreds of hours, where my skills are a little ‘wobbly’. Of course I rehearse before class but the reality is that I will be learning just as much as my students. I facilitate, I enable and, in return, my students inspire me. Which is actually kind of wonderful! And a fabulous feather by Debs Nixon! 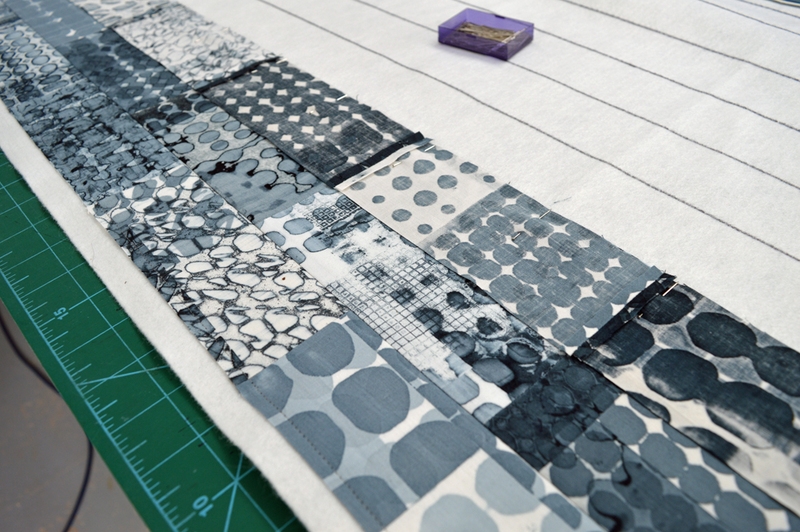 Time to get real ….. I’ve auditioned fabrics and stitched some samples but now I need to commit to a ‘proper’ piece. And for me that inevitably means a large scale piece. Time for a quick drawing on a scrap of paper to work out exactly what size and I’m off! 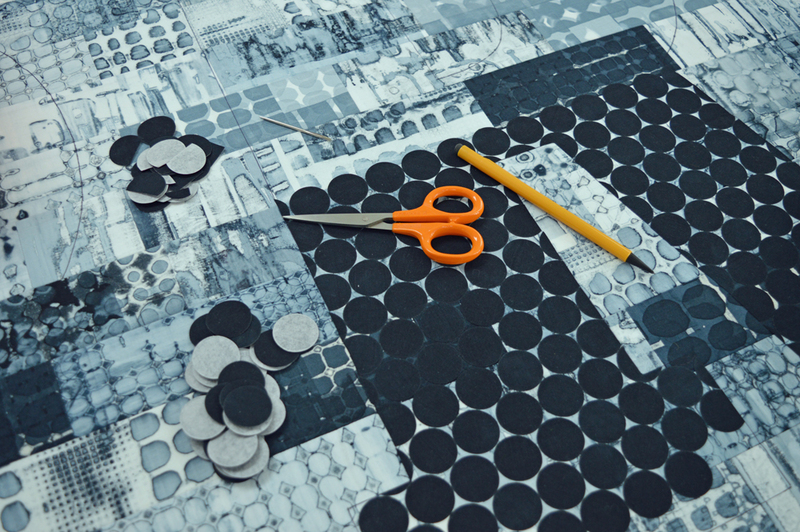 First I take all my beautiful breakdown printed fabrics and cut them into rectangles. I don’t ‘cherry pick’, I just cut everything up. 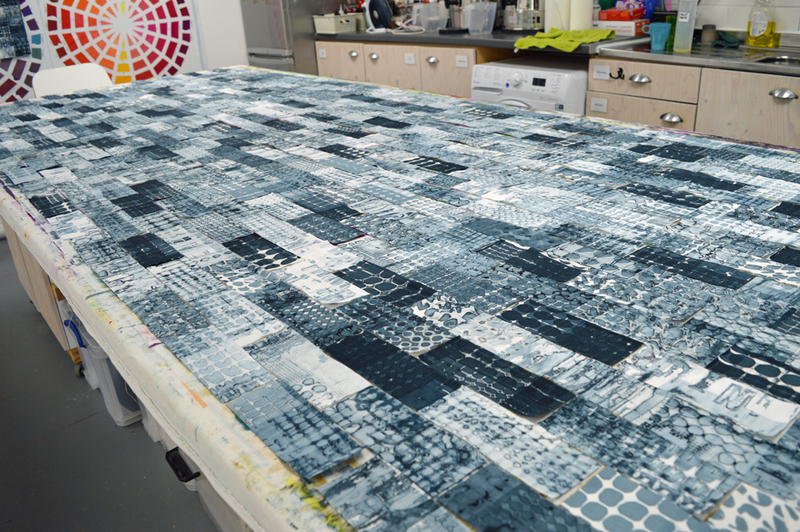 I take the cut pieces and jumble them up then close my eyes and pull them out one by one ready to lay them down in rows on my big print bench. I try to make this process as random as I can. The control freak in me would agonise over this part of the process and would inevitable produce a background that would not be as interesting as when I let serendipity happen. 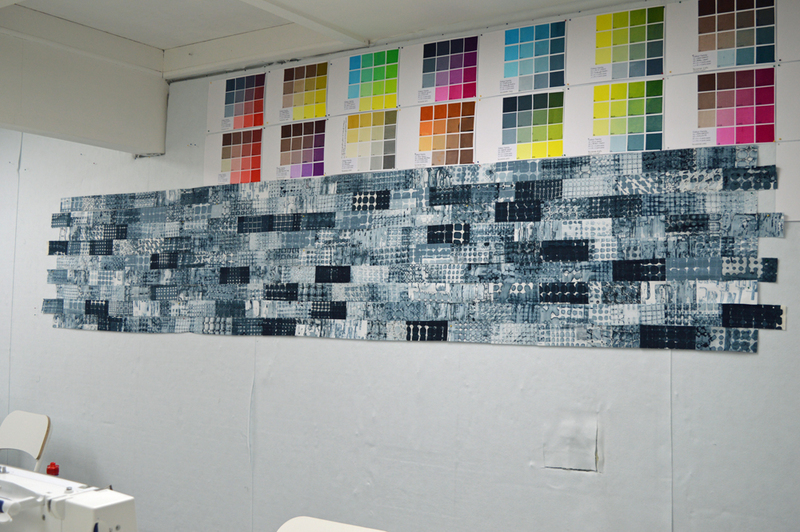 I sew the pieces together into long rows and put them up on my design wall. I like to leave the rows up there for a while and allow myself to change a handful of pieces to balance the colour and composition of the background. Just a handful - I do not give in to the temptation to change too many pieces! 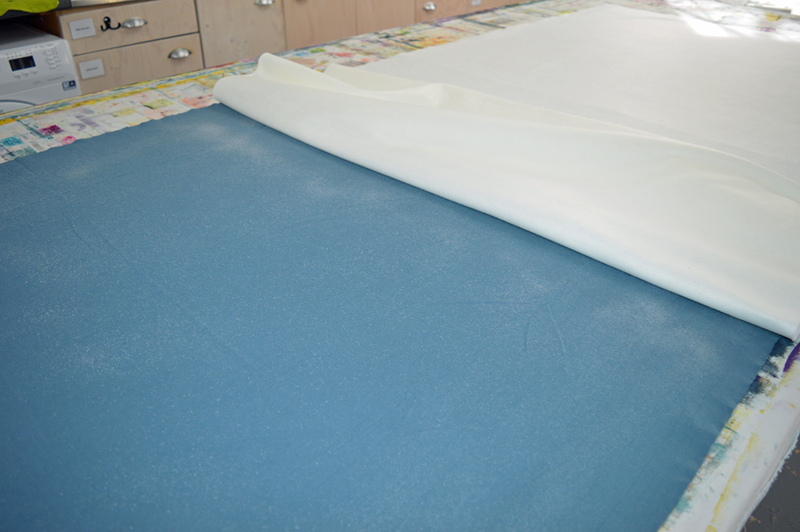 I then prepare my backing fabric and my wadding (I use acrylic felt as I like how flat it is). Having cut them to size I use an adhesive spray to stick them together. I draw parallel lines, 2 inches apart, on my wadding and use a ‘stitch and flip’ process to sew my rows together and to the backing in a single process. This way I can ensure that my rows are sewn together accurately. Yes, I fully embrace my inner control freak for this part of my process! And it has the advantage that I don’t have a separate basting stage. I have always hated basting quilts! I now have my background. It is ready for me to add what I call my top structures and to add stitch. 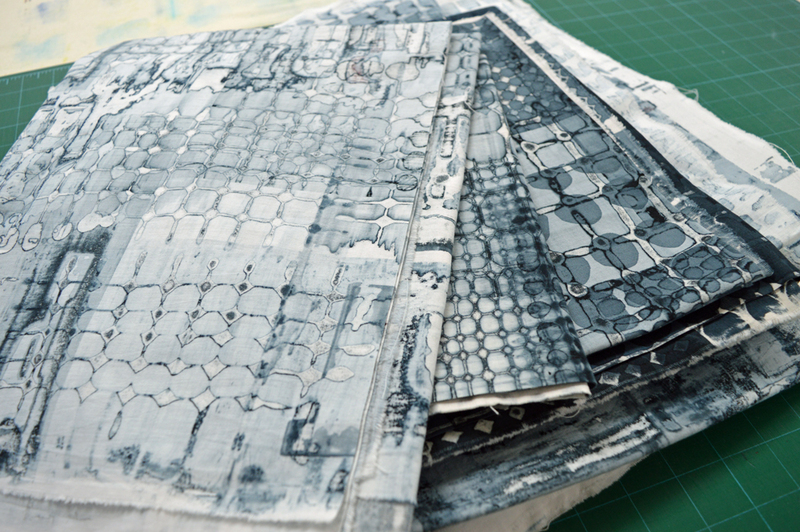 As with my Ruins series I am stitching lots and lots of parallel lines in my new Print series. I can’t image not adding stitch but at the same time I don’t want the stitching to distract from the fabrics. Simple lines seems to work well with fabrics that contain so much detail. In one of my samples for this series I stitched a word as my top structure. I’ll probably use this idea for one or more of the pieces I will make in this series but for this first piece I had a light bulb moment and have gone in a different direction. And it is a direction that could not be sampled on a small scale piece. 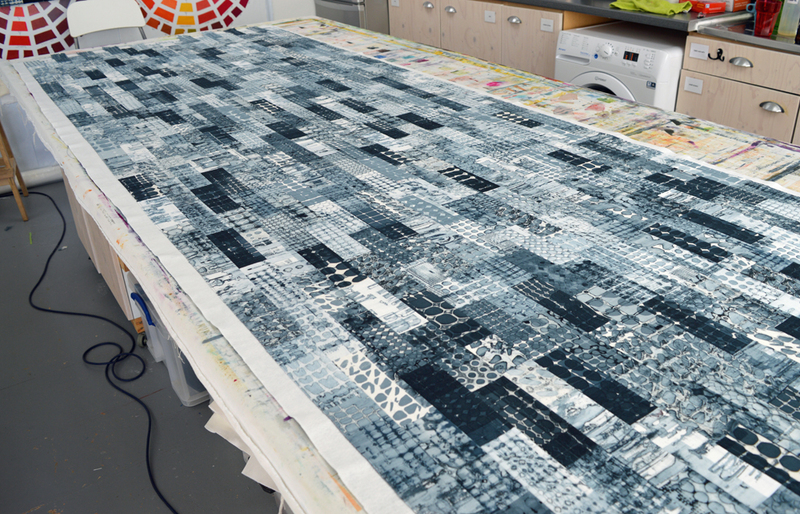 Yes my ‘sample’ is 290cm wide by 100cm high and is going to have a prime position in my upcoming exhibition so you only get see these work in progress shots! There is a saying that fortune favours the brave …. I’m certainly hoping so! Two four day shows in successive weeks with just two days at home between them was always going to be a ‘challenge’ but what a wonderful way to exhaust myself! The Fashion and Embroidery Show at the NEC, Birmingham was brilliant. I was delighted to be given a bigger stand than expected as it meant I could take more quilts to show. 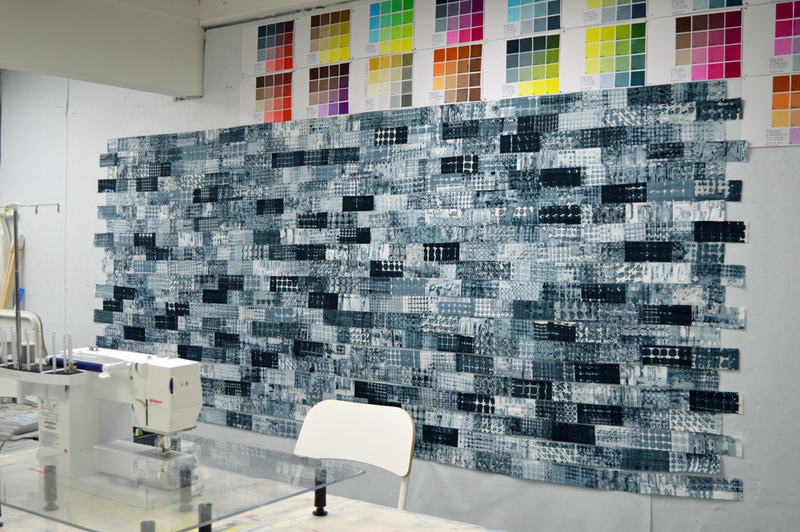 I decided to show one of my big Ruins quilts on the back wall and was overwhelmed by the response - so many wonderful comments. Big, big thank you to everybody who stopped by the stand! And a super, big thank you to my son, Joe, who came to both shows with me. I simply could not have done without him. He even did a bit of printing when I was busy away from the stand! This is definitely a family affair. And now I’m home and have just finished washing fabrics, cleaning screens and catching up on paperwork. For those of you who watched me printing at the shows below are some of my demonstration pieces from the shows. The piece at the top of this post was printed in Birmingham. I’ve indulged in an afternoon nap and a couple of early nights. Batteries fully recharged. What next? 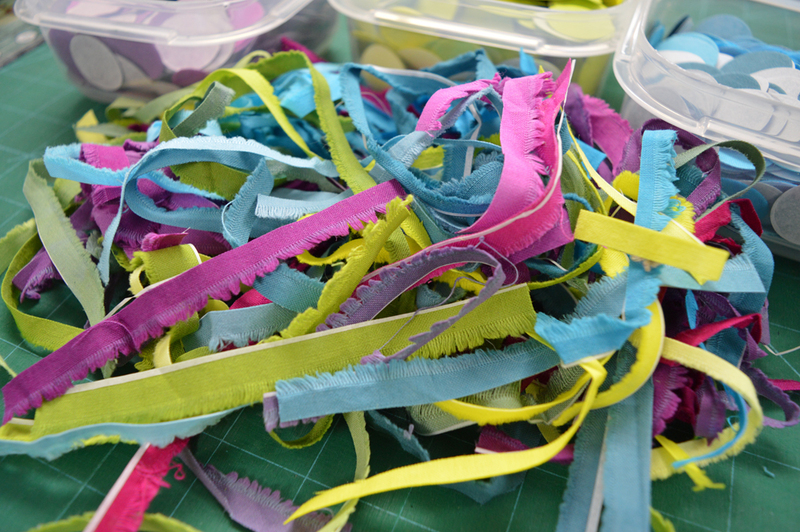 Making lots and lots of art for my exhibition at this summers Festival of Quilts. Living the dream! 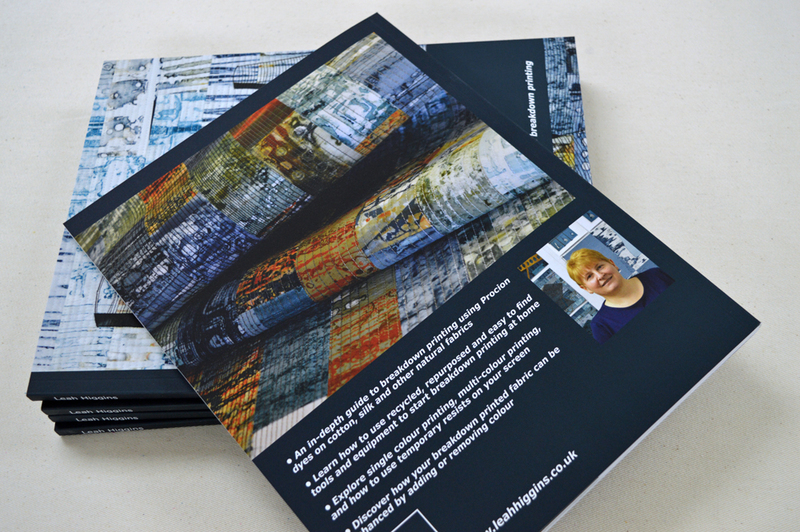 Printed in Glasgow, breakdown printing and printing using screens with torn masking tape resists. Printed in Birmingham, all breakdown printing. A quick, but heartfelt, thank you to all the lovely people who stopped by my stand at The Creative Craft Show in Glasgow. I can’t help but be a bit nervous when I’m demonstrating as being at a show is not a great place to print some uninteresting / downright ugly fabric. This time around however I really liked some of the pieces I printed. As soon as I get a moment I will wash the fabrics out and share with you. No surprises that the pieces are breakdown printed! But that will have to wait as I am back on the road on Wednesday ready for the Fashion and Embroidery Show at the NEC in Birmingham. The show runs from Thursday to Sunday and I’ll be on stand L40 in Hall 12. I’ve spent the today preparing more breakdown screens. Fingers crossed for lovely fabric! I am my own worst enemy! I have a habit of taking on just a little bit more than I should then setting myself challenging deadlines. I did just that with the decision to write my first book, Breakdown Your Palette. But the late nights were worth it - I have been completely overwhelmed by the response and a big thank you to those of you who ordered the book and who got in touch to tell me how much you liked it. I am feeling very loved right know! Having launched the book I was feeling just a little bit tired. By chance (or maybe by careful planning!) last week was my annual five day retreat with members of the North West Contemporary Quilt Group. It was wonderful. 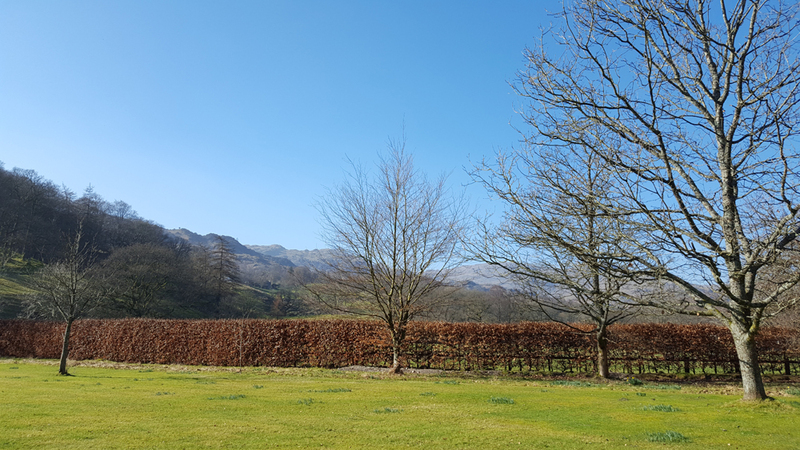 Lovely location on the edge of Grasmere in the Lake District surrounded by hills and sheep. Great weather. And fantastic company. This was our ninth retreat together so we are very ‘comfortable’ with each other. We did some things as a group but mostly we worked on our own projects in a room that was filled with chat, with laughter and sometimes with a gentle silence. It was just what I need to recharge my energies and redirect my focus towards creating new art for my solo exhibition at the Festival of Quilts in August. I spent many hours at my sewing machine working on a new large piece in my Ruins series inspired by the Cotton mills in the area I live in. This was great thinking time and I now have a clear plan for the pieces I need to make. And yes I have probably given myself a little bit more to do than I have time for but it worked with the book so I will make sure it works for the exhibition! But before I can get ‘stuck in’ though I have two shows - one in Glasgow this week and one in Birmingham next week. I will be giving a 90 minute workshop each morning called Colourful Cityscapes (you can buy tickets by following the links) and will be demonstrating breakdown printing on my stand in the afternoons. I’ll have lots of copies of my book with me as well. If you are visiting the shows please stop by the stand, it is great putting faces to names! About 10 months ago I made the BIG decision to leave corporate life and to earn my living as a full-time artist, teacher and now, author. In some ways it was a really easy decision to make - I am doing the things I love most, in the place where I am happiest, I can be a better carer for my husband and can provide support for the rest of my family when they need it. I have swapped 90 minutes each day sat in traffic for an absolutely ghastly twenty metre commute to the bottom of the garden! And with any luck I will never have to wear a suit again! I am living my dream! But it was still a big decision because of money. What else? We still have a mortgage to pay and a big, old house that costs a fortune to heat and always seems to have something that needs fixing. We were also used to a good income and the comforts that come with it. Stopping spending money on stuff we really didn’t need was an easy sacrifice to make. But could I make enough money to keep the lights on and food on the table? On paper, with a business plan and a lot of determination and hard work the answer is ‘just about’. But not immediately. I have been amazed by the response I have had to my workshops but, currently, the income from them is erratic and I think it will take a year or two before I have built up a good reputation and student base. 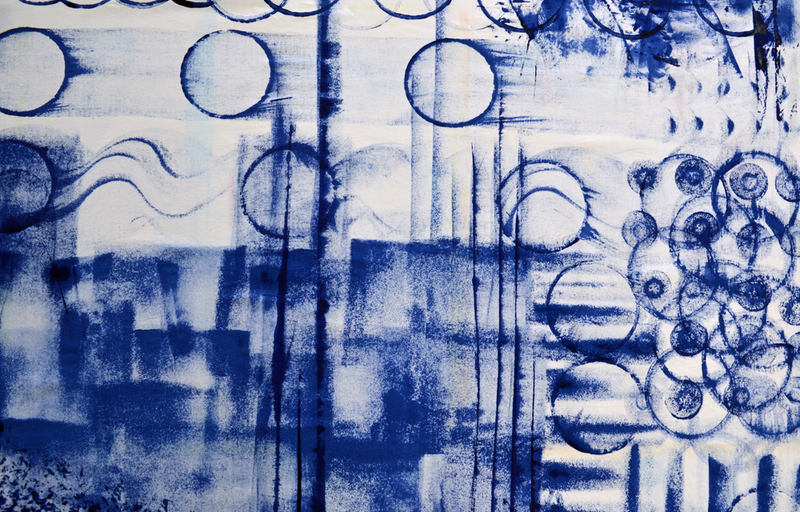 It would be wonderful if I could make up the shortfall by selling my art but I am a realist. So I needed to look at other income streams. Cue my good friend Ruth Brown. Having written two very successful books herself, she was able to show me the financial advantages of investing my time in writing a book. More importantly, she believed I could do it and gave me loads of encouragement when I had all those moments of self doubt. Thank you Ruth x. 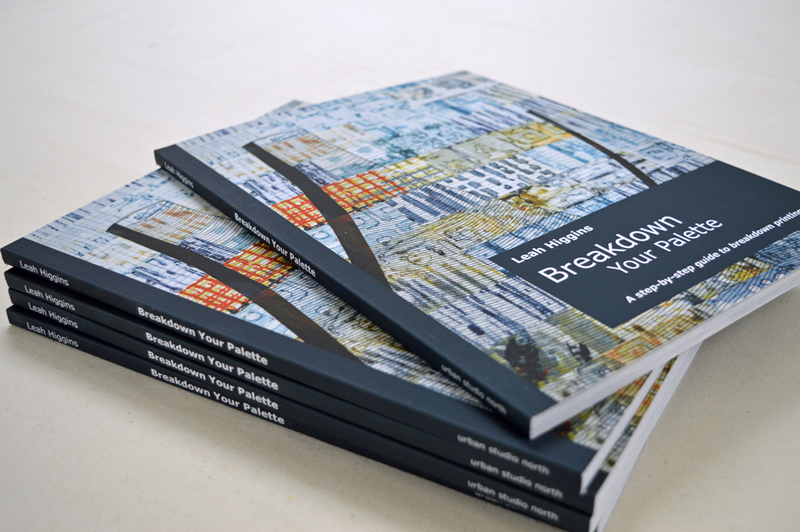 And of course the book had to be about breakdown printing - I have spent the last few years obsessed by it. Having a science background I have inevitably focused on trying to control the process and it is this depth of understanding that I have tried to convey in the book. Along with a practical, common sense approach to screen printing at home - after all I didn’t always have a lovely studio to work in. 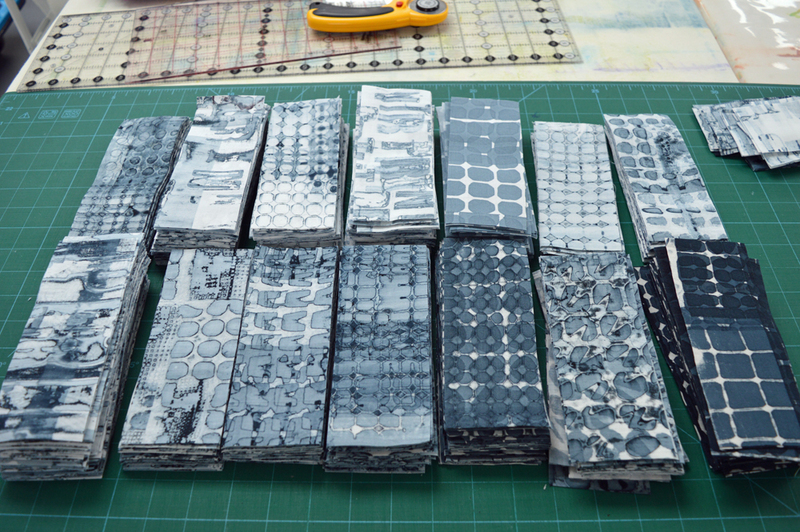 It took me a little while to decide on the structure of the book but then I got to make lots of different samples - heaven! I have been so focused over the last few years on working in series and with restricted colour palettes it was an absolute joy to work in lots of different ways with lots of different colours! Not that every sample worked out first time - yes I made some pieces of truly ugly fabric along the way but then had fun figuring out how to ‘rescue’ them! I couldn’t figure out how to photograph myself whilst printing. Cue my oldest son Joe. No previous experience but now photographer par excellence! We took over 2000 photos of which most were discarded and ended up with over 350 images in the book. Digital photography is a wonderful thing especially combined with Photoshop! The ‘writing’ part of the book came relatively easily as I had some experience writing technical documents and manuals in my previous life. Although I am indebted to Ruth and to my daughter Jess for their proof reading skills. I tend to write like I speak, without drawing breath. Luckily Jess had an endless supply of commas. And don’t get her started on apostrophes. Apparently I am hopeless. And I am doubly indebted to my daughters partner, Matt Walkerdine who, conveniently, is a graphic designer. He got me started using Adobe InDesign for the book layout and held my hand as we prepared the files for printing and submitted them. The geek in me has thoroughly enjoyed learning how to use a new piece of software. Jess and Matt also run a small indie publishing company which has been useful. This book has been a labour of love. And a family affair. I am a very lucky woman and chuffed to bits with my first book! And very, very happy with the response it has got - thank you everyone for your kind words and your orders x. Wonder what I’ll write about next?